In our recent survey of IB students applying to university in the 2017/18 academic year, we found that girls enjoy a higher offer rate than boys. Why? In our second blog post looking at some of the most interesting insights from our 2018 IB Student Survey, we’re shifting our focus to look in more depth at IB students’ rates of success when they actually applied to university in the last academic year. 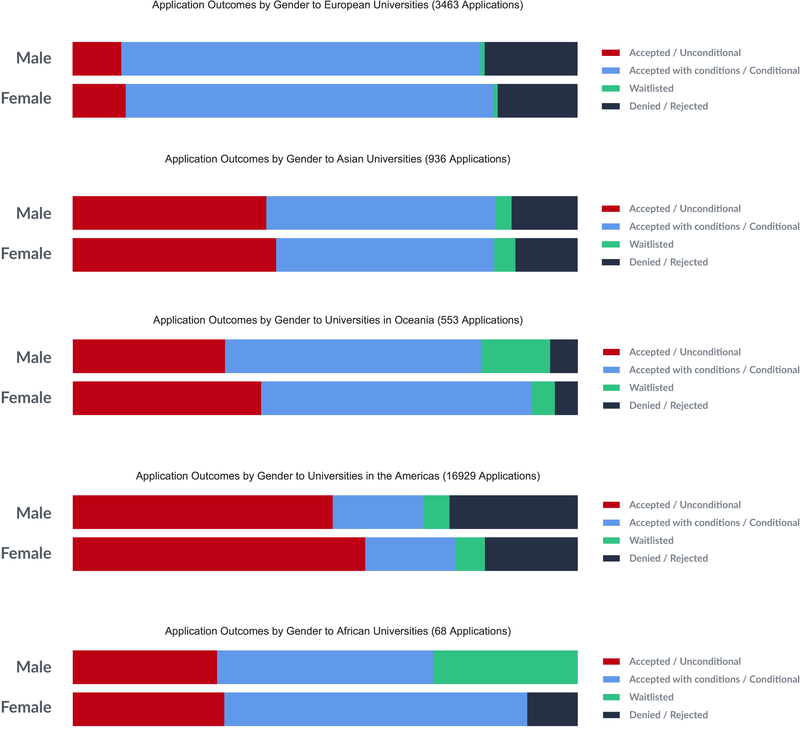 As part of the analysis of our 2018 survey data, we broke down IB students’ application success by gender, and the results have revealed some interesting trends in how female and male students perform when we compare their university acceptance rates. Our 2018 survey found that, by almost every measure of success in this year’s survey, girls are outperforming boys. Whilst male students might be more confident in terms of the number of applications they submit to prestigious higher education institutions, female IB students are more likely to receive offers. Female IB students are receiving more unconditional offers, regardless of their predicted grades. Girls have a higher success rate in almost every subject category in our survey, even with subjects which are more popular with boys. So why are female IB students outperforming their male counterparts? Let’s take a look at our survey data in more detail. The first major difference can be seen when we examine the applications to, and offers from, the most popular universities in our 2018 survey. Whilst male students are nearly 50% more likely to apply to Princeton, female students were as much as 150% more likely to receive an offer from Princeton. Female IB students are demonstrably outperforming their male counterparts in applications to the Massachusetts Institute of Technology (MIT), with girls over 200% more likely to be offered a place than boys. Having examined male/female success rates at the most popular universities in our 2018 survey, we wanted to see if girls were outperforming boys overall. Female IB students had an overall offer/acceptance rate of 50%, compared to 44% for male students. Boys reported a higher overall rejection rate in their university applications at 24%, as opposed to 18% for girls. Having identified a higher female success rate overall, we sought to understand this pattern further by analysing female and male applications on a regional basis. 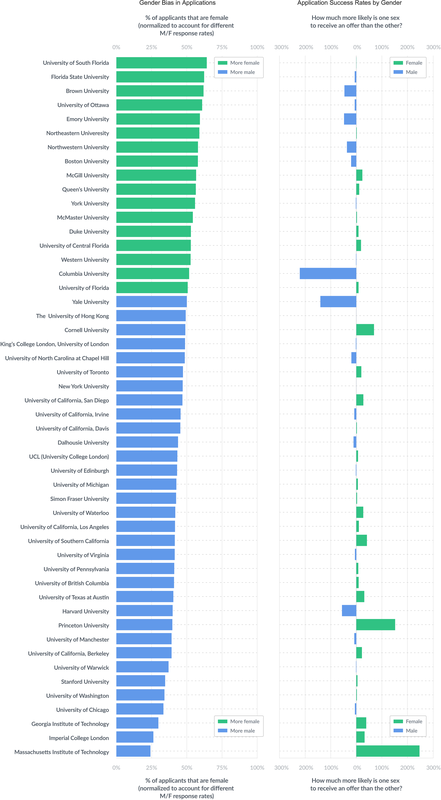 Female students continue to enjoy a higher offer rate regardless of which region they are applying to (so there is no one region of the world where universities might be giving more offers to female students). As well as breaking down application success by their region of destination, our study also analysed application success by students’ region of origin. Again, female IB students continued to enjoy a higher offer rate. 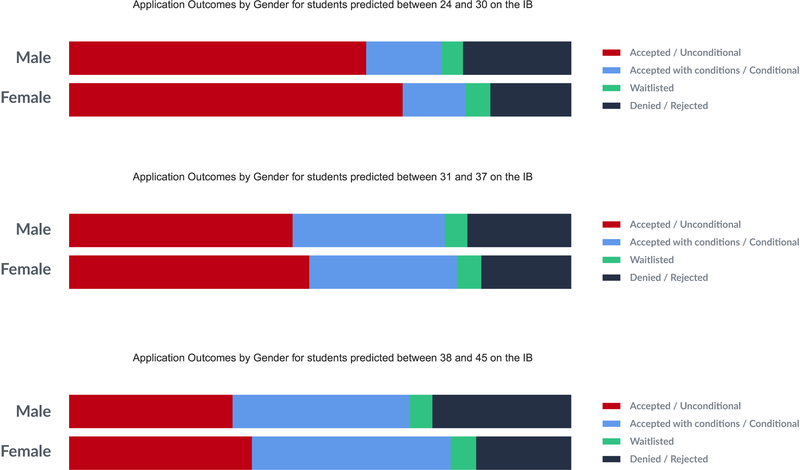 Having ruled out any regional factor which could explain the higher success rate of female students, our next dataset investigated the hypothesis that universities were making more offers to female students based on their predicted IB grades, compared to their male counterparts. Within each IB grade band, girls received a higher proportion of unconditional offers/acceptances than boys, meaning there is no evidence which points to universities favouring girls over boys based on their predicted IB grades. Male students also had a higher proportion of overall rejections in every grade band. Having accounted for students’ region of origin, their region of destination and their predicted grades, we next analysed if female IB students were receiving more favourable offer rates because they were applying to less competitive subjects. Analysis: what were the most competitive subjects for IB students in 2018? Before analysing student success rates by subject, let’s take a look at the most competitive subjects for the IB students in our 2018 cohort. For the students surveyed this year, Maths/Computing based subjects had the highest rate of rejections, along with Engineering. Meanwhile the subjects with the highest overall acceptance rates, and the lowest rejection rates, were Education and Journalism/Media courses. So what are the most popular subjects for male and female students, and can this help us to understand the higher overall female success rate? 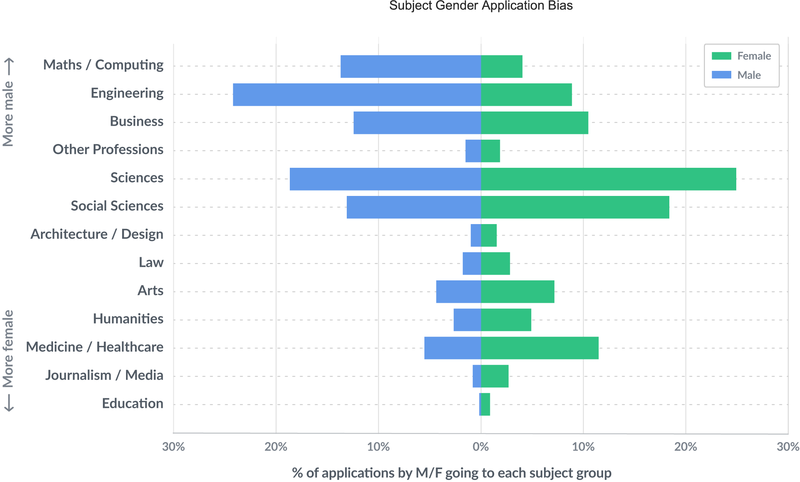 The data plot above illustrates the likelihood of male and female IB students to apply to different subject groups. Based on this data, we can see that girls are more likely to apply to subjects with higher offer rates. (e.g. Journalism/Media & Education). Meanwhile, there is a greater likelihood of boys applying to STEM subjects, such as Maths/Computing and Engineering; these were the subjects in our survey which had a higher rejection rate, and were more competitive overall. Boys were more than three times as likely to apply to Maths/Computing, more than twice as likely to apply to Engineering, and twenty per cent more likely to apply to a Business degree. By contrast, girls were more than three times as likely to apply to Journalism, and more than 5 times as likely to apply to Education. It’s possible that the higher offer rate for female students could be, at least partially, explained by their applying to less competitive subjects. This means that the trend towards higher female offer rates should disappear if we break down student applications on a subject-by-subject basis. When we compare the offer/acceptance rates of male and female IB students on a subject-by-subject basis, we see that girls continue to outperform boys regardless of subject. Girls received 10% more unconditional offers/acceptances for Engineering courses than boys, and outperformed boys for Maths/Computing by 6%. Girls also received 10% more unconditional offers for Medicine/Healthcare. 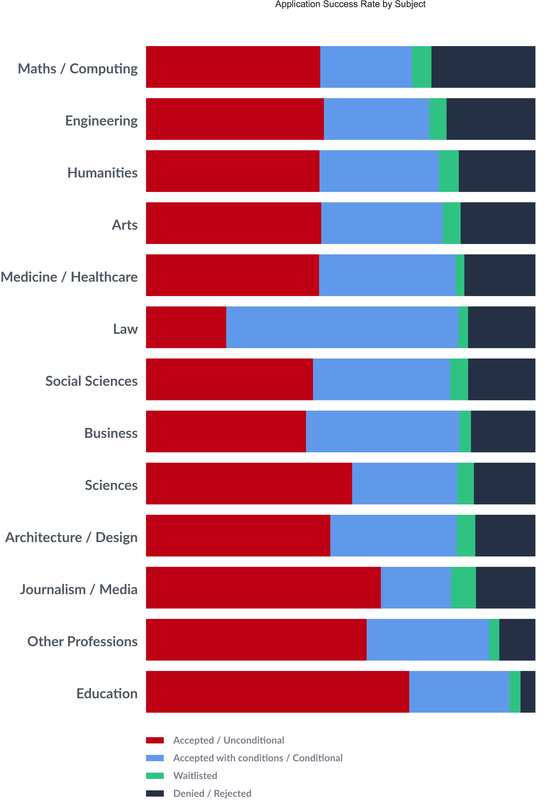 Interestingly, male students only received more unconditional offers/acceptances for Education and Architecture based degrees (incidentally, these subjects had a higher proportion of female applicants). 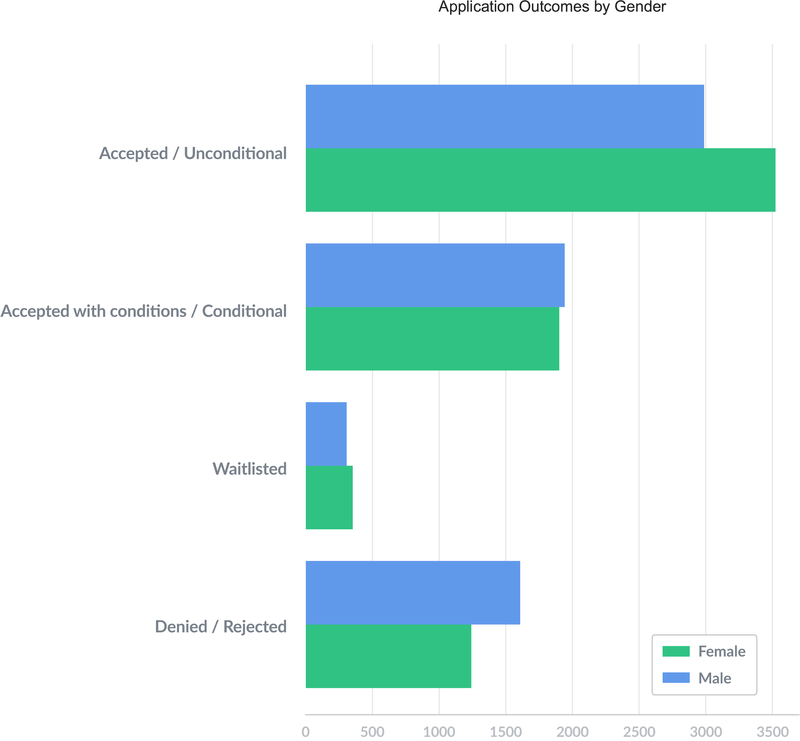 This means that the success of female applicants in this year’s survey cannot be explained by their applying in larger volumes to easier subjects, or courses with a more generous offer rate. Can we explain girls’ higher offer rate in this year’s IB survey? We’ve found that girls outperform boys regardless of the destination they’re applying to, their academic profile, or the subject they choose to study at university. So why might female applicants in our survey be outperforming their male counterparts? Whilst we didn’t investigate this further for the purposes of our 2018 report, here are a few of the possibilities which we may analyse in future reports. Female IB students could be performing better because the rest of their application (e.g. essays, personal statements, references, interview performance) is stronger overall. It’s possible that female IB students in our 2018 survey underestimated their academic performance; this is supported by existing studies which that women are more likely to underestimate their professional performance than their male counterparts. If you’d like to read more about the findings from our 2018 report, ‘Life After The IB’, then download your free copy below.